Our large canvas bag is perfect to use for keeping your knitting projects in. Any name can be printed as these are perfect for Auntie's, Grandma's and anyone who loves to knit! 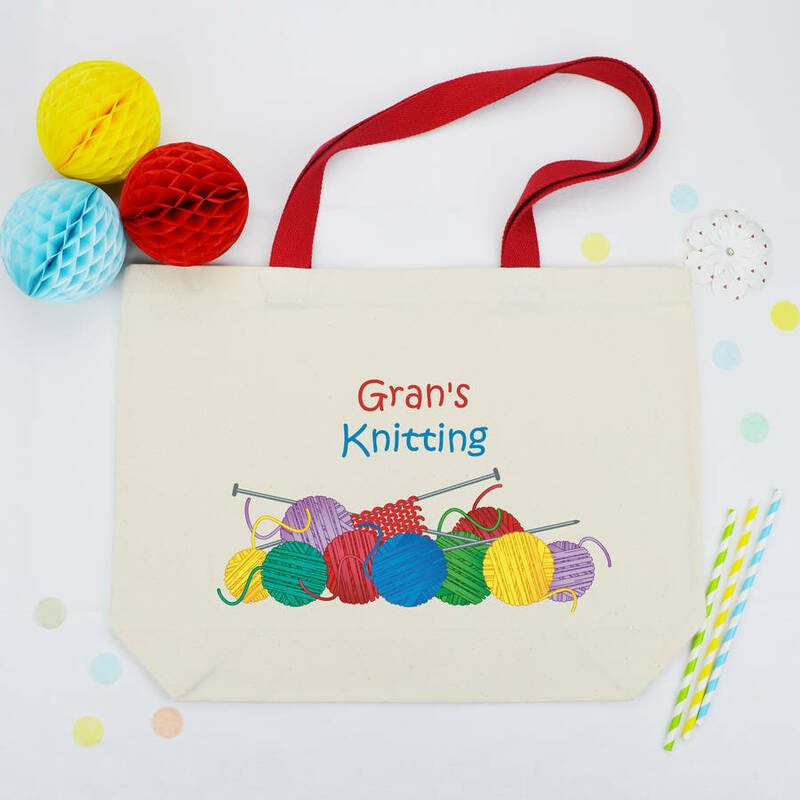 If you attend knitting classes this is perfect for carrying your wool in, or simply when you are on the move and want your Knitting with you, on the train, the bus or just to store your current project in at home. This large landscape shaped bag opens up into a generous size to fill with plenty of wool. The long coloured straps are comfortable to wear on your shoulder leaving your hands free. These bags are available with handles in either Red or Pink. 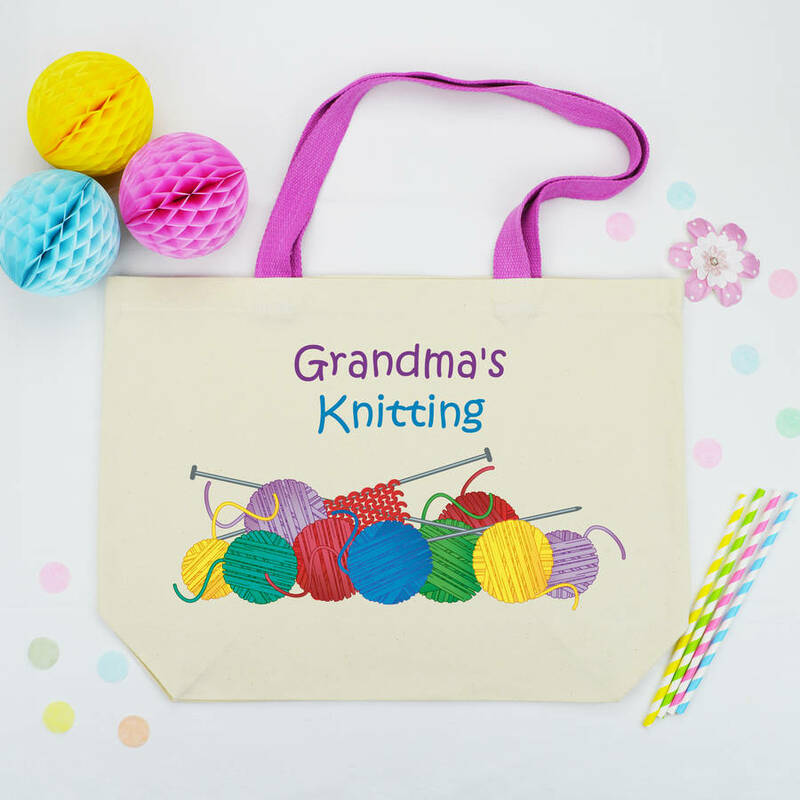 These bags make the perfect gift for any occasion, Birthdays, Valentines, Christmas, Weddings, Anniversaries, Easter, Mother's Day, or if you just want to treat a special family member or friend! They even make a great gift for Teachers! Designed and printed by Andrea fays. 100% 8oz cotton canvas. Unbleached and undyed. Webbing handles. Flat measurements are 47cm (w) x 35cm (h) with a 12cm gusset, the coloured handles measure approx 63cm long. This product is dispatched to you by Andrea Fays.